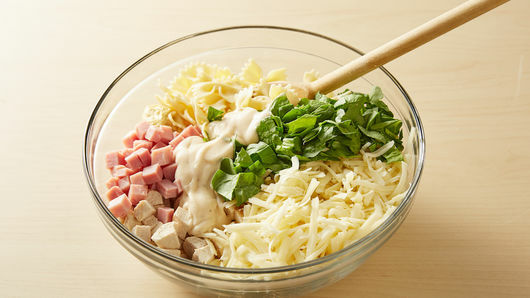 In large bowl, mix all ingredients until well mixed. Spoon evenly into baking dish. Cover with foil. Bake 25 to 30 minutes or until heated through and cheese is melted OR freeze and bake later as directed in step 4. Let stand, covered, 5 minutes before serving. If making ahead to bake at a later date: Wrap foil-covered baking dish in double layer of plastic wrap; label and freeze up to 3 months. To thaw and bake: Thaw overnight or until completely thawed in refrigerator. Remove plastic. Cover with foil. Bake 50 to 60 minutes or until center is hot (165°F) and cheese is melted. 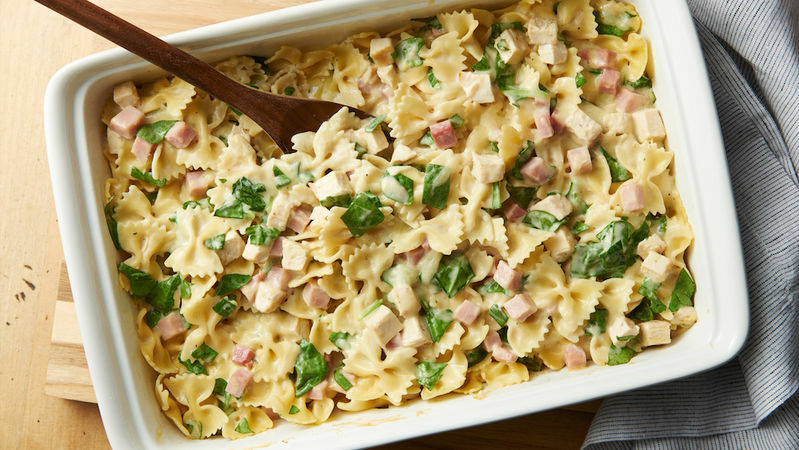 You can use any cheese you like for this -- Swiss is the classic choice, but Monterey Jack would also be great! For crunchy topping: In small bowl, mix 2 tablespoons melted butter and 1/2 cup Progresso™ panko crispy bread crumbs. After removing foil, sprinkle with bread crumb mixture. Bake uncovered 10 to 15 minutes longer or until crumbs are golden brown.